September 2018 has been highlighted as Scroll Free September. This is when you are supposed to give up looking at social media, especially on your phone, for 30 days. The reasons behind this are to draw attention to the dangers of perpetually being on social media, 24/7. And that social media is dangerous for children and young people. Especially in the light of cyber bullying, radicalisation, image awareness problems and too much screen time. This is The Commenting Club, so I am going to suggest you post a comment on a blog instead! Some people say blogs are part of social media. And yes, they are certainly connected. But I would say reading a post properly from beginning to end, and then thinking carefully about it, is a much better pastime than the disjointed and sporadic posts you find on social media. And once you've thought about it, create a structured and relevant answer in your head. Then find the comment box and write down your thoughts in there. Et voilá, that is how you post a comment! In a world of time-poor people, and the ever-shortening attention spans, the art of reading something properly is fast declining. We expect everything to be immediate. We wallow in quick reading, like comics and cartoons. Videos do better if they are short, likewise with podcasts. And writing has had to adapt in order to get read. Shorter sentences and paragraphs. Ignoring the ancient ways of grammar to reinvent a new punctuation usage. If you're no longer being constantly distracted by social media, you'll soon find the time to post a comment now and again. And I mean a proper comment. Not something useless and worthless like a single word or a one-liner. There is space in your day to have a really good think about your comment, and to write something decent and respectable that is worth reading. Take the opportunity to practice your comment writing too. Focus on providing a beginning, middle and end. Learn the wonders of précis to fit in what you want to say within a small space. Brush up on your powers of communication in the written form whenever you next post a comment. When did you last post a comment on a blog? The art of blog commenting has declined since 2014, after many eminent bloggers closed their comment facilities. And as a result everybody moved onto social media, which meant the style of commenting changed. So if you are participating in Scroll Free September this year, but your fingers are still itching to use your phone, use it to find blog posts instead! Read them carefully and search for the comment boxes to post a comment. Start using your brain differently, to exercise those writing skills that have lain dormant for so long. This is the month for some proper comment writing. No reaching for emojis and gifs to fill up the spaces. No inane noises that are meaningless, there is no need to just 'do something' to save face and show you are 'there'. They say all detoxing is good for you. If you give up on something, you need an alternative to distract you. Blog commenting is a half way house from using social media and completely nothing. You will learn new things and broaden your horizons. You may even find reading enjoyable again. Your responses and reactions will always be there, just this time you will express them differently. Have a go at commenting again. 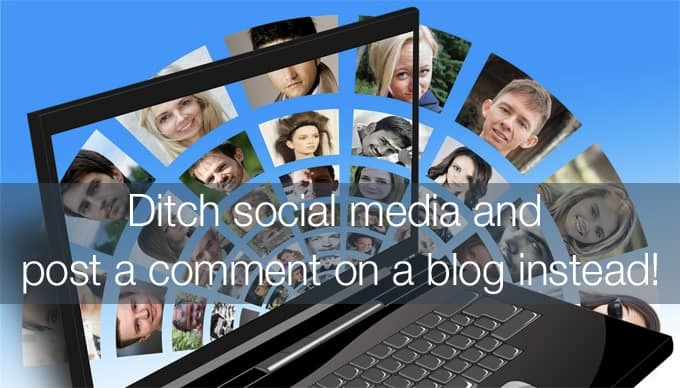 Post a comment on a blog and let me know how you felt about it in this comment box below. Let us relate to each other on how we are going to get through Scroll Free September. And you never know, it might be the making of you! Ohhh… I have been missing blog commenting too!! The challenge is to think of something that is interesting that instigates a dialog so the comments are just as interesting as the blog itself. If the readership is right I take it this should happen naturally? Yes, Gill, it does depend upon the readership. If they are chatty and like to be interactive, there will be more comments. However, it also depends upon the subject matter, and whether it resonates with the readers. If they can relate to what the post says, this will make it more likely to get comments. And if a commenter is able to think of something that would provoke a dialogue, this will lead onto a discussion, which is even better! I like the idea of reading more blogs than social media. Where would I find the blogs I would like to read and is there a way of seeing how long they are before I start reading as time is the issue. Thank you for your comment Honey. I am creating an online course on How to Create a Commenting Marketing Strategy in which I discuss where to find relevant and suitable blogs to comment on. It will be available to non-members at a much larger price than if you become a member of The Commenting Club. Watch this space for more details. Good to be here again. You brought out yet another serious issue thru this post. It is really sad to note that this trend is growing among the internet users. After publishing a post on our blog page we generally post the link in the social media, but unfortunately, the majority likes it and post one or two line comments, there they leave it and do not take the pain to post a comment on the original page. This really pained me several times, especially when I post a roundup post with a good number of influencers, but sad to note when I tag those influencers most of them respond to the social media share, and only a very few come to the original page to post a feedback. As the post heading, yes, we need to ditch the social media and active on the original post. Have a great time of commenting and sharing ahead. Hi Philip, thanks for commenting and apologies for taking so long to reply (I’ve been on holiday without WiFi access). You’re right, the connection between posting blog updates on social media and then returning to the original source to comment has been lost. A comment will mean so much more if it is placed underneath the post it refers to. However the world is either lazy or time-poor and has little inclination to bother finding the relevant post – it’s much easier to comment there and then. Closing comments on a blog reveals the reverse situation. There have been plenty of times when I’ve read an excellent post, only to find I cannot leave a comment. The process of searching out the author on social media to leave my comment evaporates the ardour I once had, and the momentum is lost. Glad to see my comment approved though it is a bit late. I understand the difficulty in getting a wifi connection in travel or holiday season. Regarding closing comment option too is an awkward situation for comment authors. Once I asked one of the top commentator and travel blogger about the closing of his comment option in one of his websites. He said, Philip, since I am a moving blogger, I may not get time to respond to the comment authors and that creates a kind of confusion and misunderstanding so I closed it and am responding instantly to my commenters via my facebook. I think this is not a good option, and sad to say that he was and is a comment promoter and a spokesperson of comment promotion. In fact, he was known among bloggers as Comment King. I think I need to put a full stop here. I am much elated by this! Have a wonderful and profitable weekend. Hi Philip – you’re becoming more than one of my regular commenters, I’m almost expecting you to turn up! How interesting about the Comment King! He finds the time to respond to his comments on social media, but not on his blog! This may be because the kind of comments he can get away with on social media may be instant, but are obviously not suitable for his blog. This is why I feel the quality of commenting has gone down hill since 2014.